For Canon, which launched its first serious mirrorless interchangeable lens camera in the EOS M50, the move advances the traditional camera market share leader into the realm of consumer 4K videography. The company typically has been more cautious than its competitors about jumping onto new video camera formats before the demand has proven its potential. In this case, Canon decided to take the plunge into 4K Ultra HD using a compact mirrorless ILC model, a form factor which the DSLR-focused company also has not dabbled in as much as its rivals. Sony, on the other hand, introduced a new less-pricey iteration of its popular full-frame a7r III, in the a7 III, which rings in at a $2,000 price tag (body only), or about $1,200 less than the current 42.4-megapixel a7r III ($2,500). For the lower price, the newer camera features a 24.2-megapixel back-illuminated Exmor R CMOS image sensor and up to 10 fps continuous shooting, which is half that of the a7r III. The Sony a7 III can also shoot continuously at up to 8 fps in live view mode with minimal lag in the viewfinder or LCD screen, Sony said. The camera will be offered as part of a kit with the FE 28 70 mm F3.5 5.6 lens for $2,200. The Sony model (ILCE-7M3), which will be available in April, is positioned as a strong low-light performer with a 100-51200 ISO range, expandable to 50-204800. The camera also adds a whopping 15-stops of wide dynamic range capability at low sensitivities. This is coupled with what Sony is calling a “world-class” AF system featuring 693 phase-detection AF points convering 93% of image area, 425 contrast AF points and fast Eye AF. For video, the a7 III captures high-resolution 4K with full pixel readout across the full-width (35mm equivalent size) of the sensor and no pixel binning. Video and stills are also kept rock solid using Sony’s 5-axis optical in-body image stabilization system with a 5.0 step shutter speed advantage. For stills, the camera features up to 10 fps continuous shooting with either a mechanical shutter or in silent shooting mode, using full AF/AE tracking. 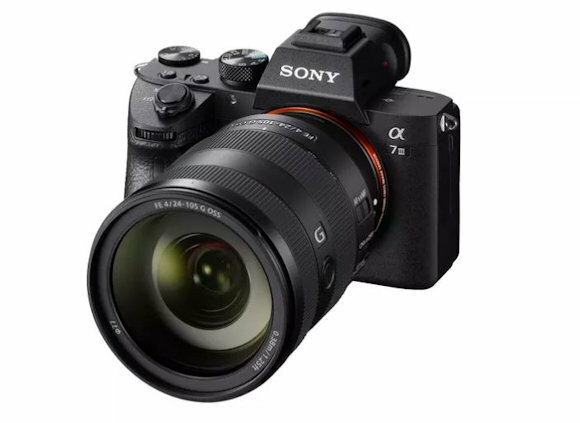 Sony said the a7 III is equipped with an updated image processing system that allows it to shoot full resolution images at the max 10 fps continuous rate for up to 177 standard JPEG images, 89 compressed RAW images or 40 uncompressed RAW images. The full-frame camera will also output 14 bit RAW format images even in silent and continuous shooting modes, Sony said. Further, Sony said the a7 III has “the longest rated battery life of any mirrorless camera at 710 shoots per charge. Other key features include: the addition of a joystick for adjusting focus points, dual SD card slots, SuperSpeed USB (v. 3.1, Gen. 1) with a Type-C terminal. Meanwhile, Canon’s latest edition, the EOS M50 (shipping in April at a $779.99 retail), offers a 24.1-megapixel APS-C sized CMOS image sensor. It also packs, Canon’s latest DIGIC 8 image processing engine. In addition to 4K video image capture, the Canon EOS M50 features a Dual Pixel AF system and a built-in 2.36m-Dot OLED viewfinder. The camera includes a 3-inch Vari-Angle touchscreen LCD monitor, built-in Wi-Fi with NFC and Bluetooth, a 5-axis image stabilization system, and an ISO range of 100-25600, extendable to 51200. The 4K video capture is a noteworthy first attempt, although it does have a 1.6x crop, and the Dual Pixel AF system won’t work while shooting 4K video. However, the EOS M50 features a 120p frame rate for video shot at 720p resolution, or up to 60p for Full HD. As a still camera, it offers a lot of potential with the mirrorless design and the built-in OLED viewfinder. In addition to the body only, Canon said it will offer the EOS M50 in several kit options including lenses and accessories.